Strong police presence as Mashaba meets Alex residents - SABC News - Breaking news, special reports, world, business, sport coverage of all South African current events. Africa's news leader. Alexandra residents recently went on a rampage demanding better service delivery. There is a strong presence at the Marlboro Community Centre, north of Johannesburg, where Mayor Herman Mashaba is meeting Alexandra community members. The visit follows a spate of sporadic protests over the past two weeks which resulted in disruptions to schooling and businesses. The residents are concerned about the mushrooming of illegal structures in the township, as well as the lack of service delivery. 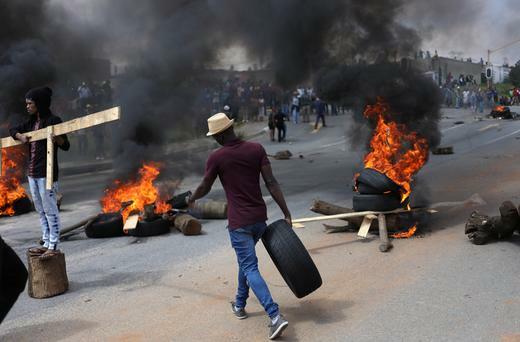 After two weeks of protests, Johannesburg Mayor Herman Mashaba is set to come face to face with angry community members shortly. The first bus load of community members arrived just before 5pm. Two more groups joined shortly afterwards while singing derogatory songs targeted at Mashaba, before going inside the hall. Some say, while they welcome the meeting, they are unhappy that he refused to come where they live. They now say they expect answers on how he will solve their problems. This entry was posted on 15 Apr 2019,06:27PM at 6:27 PM and is filed under South Africa. You can follow any responses to this entry through the RSS 2.0 feed. Both comments and pings are currently closed.